Running should be fun, right? 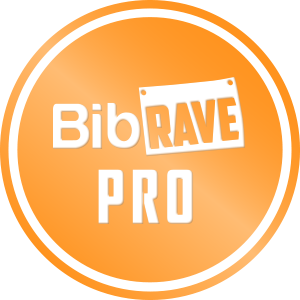 I have tried plenty of hydration products out there that look awesome, but you take them out for run and that’s when it happens. The bottle doesn’t stay in the holster and falls to the ground causing you to stop and pick it up. Maybe it holds the bottle in the holster, but you simply can’t get the bottle back into the holster easily. HydraKlick was founded by a long-time product developer and competitive runner who just wasn’t happy with the hydration products and running gear out there. The Hydration belts didn’t stay in place and the bottles sold with the belts were difficult to remove and replace. He tried the handheld bottles too, but they threw off his form. 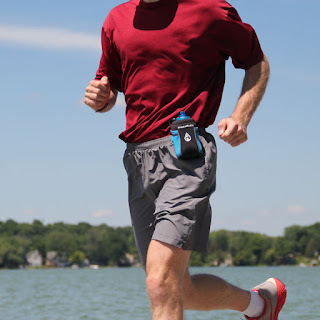 HydraKlick make products that help you run better. First let’s look at the benefit of running hands-free. 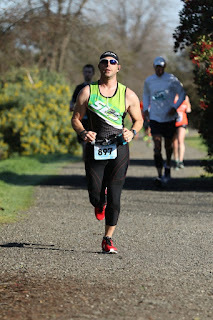 According to Runner’s World Magazine “Holding a water bottle in one hand over the course of a long run could cause an imbalance, change your stride, and lead to injury (1). The extra weigh in a water bottle is enough to cause muscle discomfort in your upper body as you run (2). For more reasons why you should run hands-free, go to the HydraKlick website (click here). They setup a very informative page on the topic. 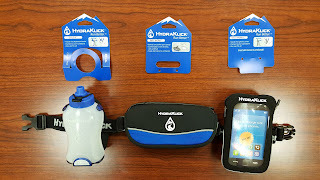 Now that you are ready to run hands-free, let’s look at some of the things that makes HydraKlick's products so good. The Solo line of products have a proprietary sport clamp, which quickly and easily grips to your waistband or belt. There is no sizing or adjusting required. Another great feature is that you can take the products apart to easily wash the belts, mobile cases, and hydration sleeves. It was extremely easy to take apart and put back together. I wish it was this easy to clean other running products that I have. Let’s look at each of the products. The Belt Intro is more than just a running belt. 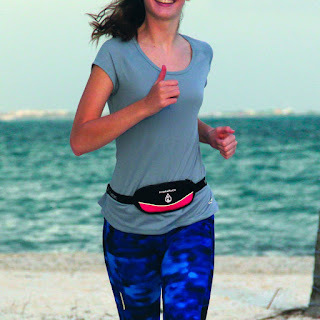 It offers a water and sweat resistant sport pouch so you can safely and securely carry your phone, ID, cash, keys or whatever else you need to take with you on your run. The sport pouch is attached to a 1-inch high-grade elastic belt which provides a great fit and won’t bounce around or ride up while you run. The belt easily adjusts from 25” to 50” and there are no loose belt straps like many of the belts out there. The pouch has a secure, top-loading zipper and reflective piping so you can be easily be seen in low-light conditions. 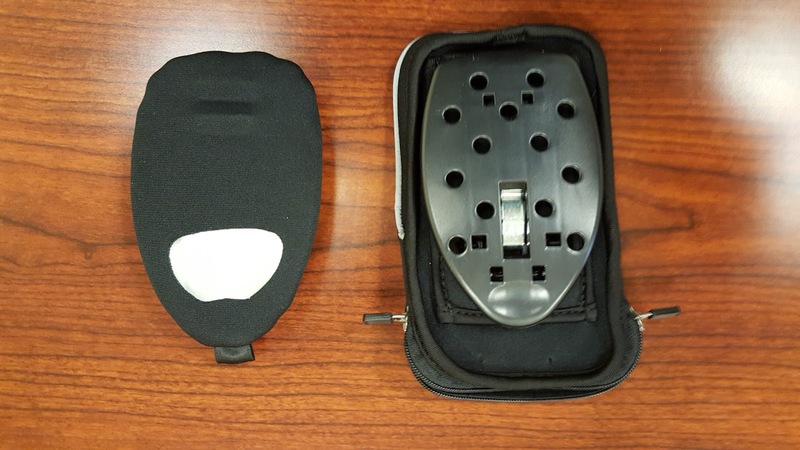 There is an internal compartment in the sport pouch so you can keep your ID separate from your phone. A problem that I have had with many of the belts out there is that they do not fit larger phones like my Samsung Galaxy S6. The HydraKlick Belt Intro fits phones that are up to 6” long including iPhone 5s & 6s, Samsung Galaxy S6, S7, and S7 Edge. You can buy yours at the HydraKlick website for $17.99 and it comes in three colors (Black and Blue, Black and Orange, and Black and Pink). 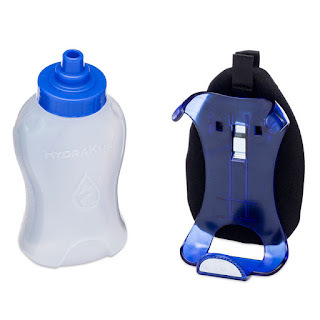 The Solo 8 is a hands-free hydration bottle and holster that you can use with the Belt Intro or just on your waistband. It comes with an 8 ounce SureGrip bottle that clicks into HydraKlick's patent-pending easy access bottle cage. There is even an elastic strap to make sure the bottle doesn’t fall out. Using the holster is simple both in taking out and putting back the bottle. I never had a problem with dropping the bottle or it falling out of the holster. Like I mentioned above, it uses a sport clamp that can securely attach to your waistband or belt. There is a contoured, washable pad that keeps the holster stable against your body. The SureGrip bottle is BPA-free, has an ergonomic, full-grip design, and comes with a speed valve cap for quick access to water. There is a hidden pocket for your ID, Cards, or a key. There is also an ultra-reflective sticker on the front of the holster for running in low-light conditions. You can buy the Solo 8 at the HydraKlick website for $17.99 and it comes in three colors (Black and Blue, Black and Orange, and Black and Pink). I regularly run with an armband. While I like having my phone on me, armbands aren’t always the most comfortable way to carry your phone. The Solo Mobile is a comfortable, easy to use, water-resistant carrier for your phone or music player. It has a zippered pouch and a large display window. The window is made with touch control technologies so you can easily use your phone while it is in the case. Like the other HydraKlick products, the Solo Mobile features the sport clamp that’s a one size fits all solution. It holds most phones (including my Galaxy S6 with a case) although it was a snug fit so anything larger than that might not fit. It was designed to fit the iPhone 5s & 6s as well as the Samsung Galaxy S6 & S7. The Solo Sleeve is a versatile, insulated neoprene pouch that hold most 8 to 10 ounce water bottles. The compartment can be used for music players, gels, or any other small items that you want to bring with you. There are pockets on either side of the compartment where you can put your gels or keys as well. The Solo Sleeve has reflective piping, a removable sleeve that you can use as a “koozie”, and it can be used on the Belt Intro just like the rest of the HydraKlick products. It is mounted on a sport clamp and everything comes apart so it is easy to clean. There is also a drawstring on the top to secure your items in the compartment. You can buy the Solo Sleeve at the HydraKlick website for $19.99 and it comes in three colors (Black and Blue, Black and Orange, and Black and Pink). HydraKlick has some awesome products that work well together or they can just be clipped to your waistband. The ability to easily take apart and clean all of the components of each product means that you will have fresh(ish) smelling products from HydraKlick for quite a while. You can either purchase them from the HydraKlick website or on Amazon, although the prices are the same. Get yours and enjoy running hands-free. Your body will thank you for it.